A concert to acknowledge the centenary of the WWI Armistice and to commemorate the sacrifice made by many in all wars. This concert to mark the end of the “War to end all Wars” began with poet Siegfried Sassoon’s short poem Aftermath which was read with simplicity and dignity by Tim Gibson. Sassoon reminds us of the horrors of war and asks ‘Have you forgotten yet?’ The fact of today’s concert, and other events and concerts marking the armistice that ended World War I, show that Australians have not forgotten. Sassoon, a recipient of the Military Cross, took a stand against the war – not the first or last soldier to elucidate the futility of war and devastation it causes. 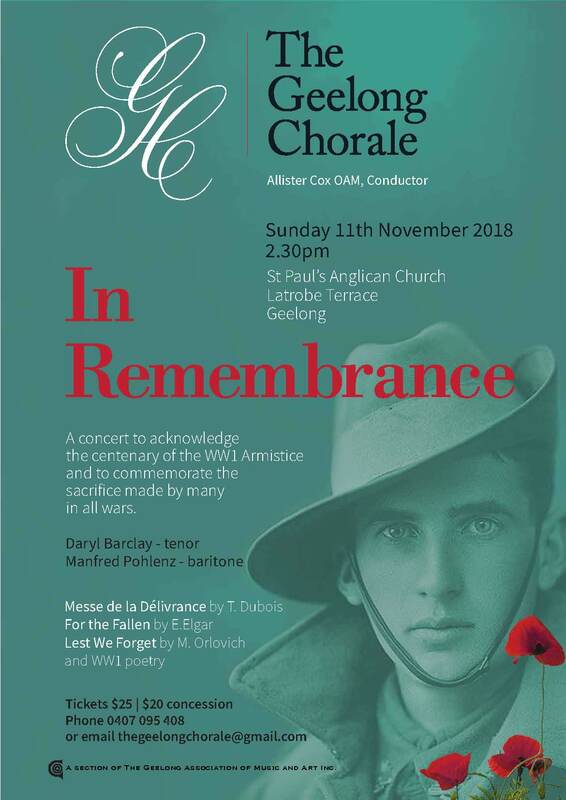 The Geelong Chorale, conducted by Allister Cox, then sang Lest We Forget composed this year by Australian Matthew Orlovich. The work is for soprano soloist, choir, clarinet and piano. Fiona Squires’ beautiful soprano soared above the choir and piano, with an ascending scale enunciating the words of the Lux Aeterna from the Requiem Mass. The work is punctuated with the chant Lest we Forget which interweaving clarinet and piano lines. The music’s end is marked by an expiration of breath from the choir – like the last gasp of a dying soldier. The talented clarinet soloist was Jess Morris, and the choir’s regular and most accomplished accompanist, Kristine Mellens, was the pianist. The sombre mood continued with the poem Anthem for Doomed Youth by Wilfred Owen, another poet of WWI. Imagery like ‘The shrill, demented choirs of wailing shells’ shows some of the horrors of this war which killed many millions of people, and wounded countless more, leaving whole nations in mourning. The music, for choir, tenor soloist, piano was completed in 1916. It begins with a steady slow marching beat from the bass notes of the piano, before a more romantic section which heralds the entrance of the choir alternating unison and harmony. The music rises in intensity and pitch heralding the soloist’s entry – ‘Death, august and royal/Sings sorrow unto immortal spheres’ – a much more glorified view of war’s destruction than the stark reality of Sassoon or Owen. The work is dedicated “to the memory of our glorious men, with a special thought for the Worcesters”. Nevertheless, this moving work honours the heroes of war, and was written in a time of bleakness to strengthen the resolve of the people of Britain. The Geelong Chorale’s performance showed a choral richness, with the choir demonstrating once again a beauty of tone in the gentle passages – none more than in the unison last line ‘to the end…’ David Campbell’s fine clear tenor and faultless diction cut through the choral texture and shone out in the solo sections. Mess de la Déliverance was composed in 1918 by Théodore Dubois to give thanks for the end of WWI. It is dedicated to the bishop and choirs of Orleans. In this performance, this extended work for tenor and baritone soloists and choir, was accompanied on the fine organ of St Paul’s church, played by Beverley Philips. The work begins with an Introit, a stirring setting of Psalm 150, which makes the most of the brass stops of the organ. The traditional movements of the Latin mass follow. This music is lusciously romantic with a wide range of vocal colour and emotion. The soloists were David Campbell and Manfred Pohlenz. The concert ended with God Shall Wipe Away All Tears the final chorale from Karl Jenkins’ The Armed Man: A Mass for Peace, composed to mark the Millennium. A large audience showed appreciation for this moving concert which was a fitting tribute to those who fight and fall in war. The Geelong Chorale’s final concert for 2018 is CAROLS AT QUEENSCLIFF, on Saturday, December 8th at 5pm, at Queenscliff Uniting Church. Today’s festival was a celebration of song and the joy that people obtain from singing together in groups. Fourteen choirs participated in an afternoon of fine music making and friendship. It was a chance for choirs to perform at their best. They did not disappoint. The program began with the host choir, The Geelong Chorale, and was introduced by John Stubbings OAM, who acted as MC throughout the afternoon. The music ranged from a 16th century madrigal, to folk songs from around the world, through popular songs, songs from musical theatre and old favourites. Even opera had its place, with a delightful rendition of ‘Painless Opera’ by Phyllis Wolfe-White by the Geelong Youth Choir. The smallest group was 8 voices (The Geelong Youth Chamber Choir), the largest around 40 voices (The Geelong Chorale). There were youth choirs, mixed choirs, a female choir (Welsh Ladies Choir), and a male choir (International Harvester Choir). The youngest singers were of primary school age, and the oldest at least 90. 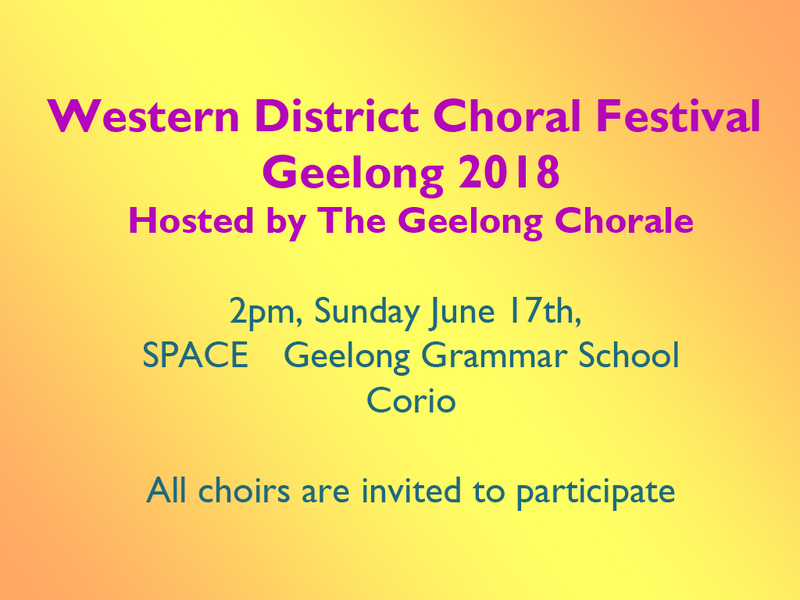 As Geelong is at the eastern end of the WDCF region, many choirs came from the Geelong area. The two groups from further afield, Colac Chorale and Apollo Bay Community Choir were warmly welcomed and greatly enhanced the afternoon’s singing. The afternoon ended with all singers merging onto the stage for a massed choir performance of “Africa”, conducted by Jodie Townsend, Director of Music at Geelong Grammar School. It is interesting to note that The International Harvester Male Chorus (formed in 1943) may be the oldest continuously performing choir in Australia in its current form. Raise the Bar, the adult section of The Geelong Youth Choir will be the featured choir for a forthcoming performance of “The Events” at GPAC. Geelong Harmony Chorus are fresh from a very successful Sweet Adelines Convention in Hobart, where they were placed fourth overall, and third in their section. At the close of the Festival, Frank Sykes, Vice-President of The Geelong Chorale, handed over the Festival to The Merri Singers from Warrnambool who will host the festival in 2019. Participating Choirs: The Geelong Chorale, Colac Chorale, Wondrous Merry, Apollo Bay Community Choir, Geelong Youth Choir, Raise the Bar Vocal Group, Geelong Harmony Chorus, Welsh Ladies Choir, International Harvester Choir, Sing Australia, Geelong, Vox Box, U3A Geelong Choir, Geelong College Community Choir, The Choir of Geelong Grammar School. Thanks to The Geelong Chorale, especially their hard working committee, and secretary Angela West, Geelong Grammar School and Jodie Townsend, for accommodating the festival in the excellent performing arts space and all participating choirs and their conductors and accompanists. Thanks also to City of Greater Geelong for their support. Download a copy of the Western District Choral Festival 2018 program here. All choirs are invited to present 10 minutes of their own music. The concert will begin with massed singing of Advance Australia Fair and conclude with massed singing of The Hallelujah Chorus (Handel). All Saints Church, Noble Street, Newtown. Saturday, December 2nd, 5pm. 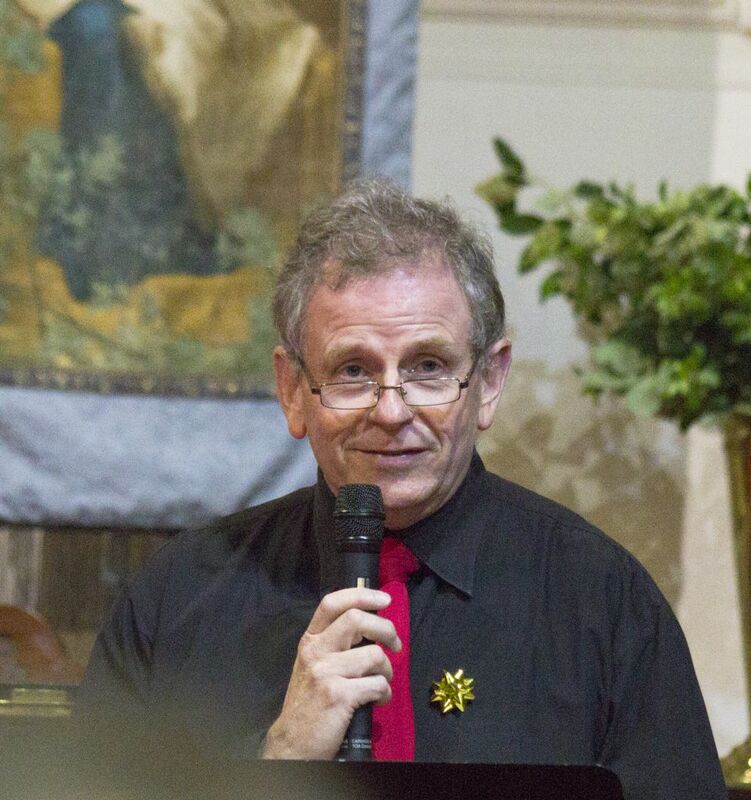 Allister Cox conducted a choir of 37 singers in a program of carols from around the world. 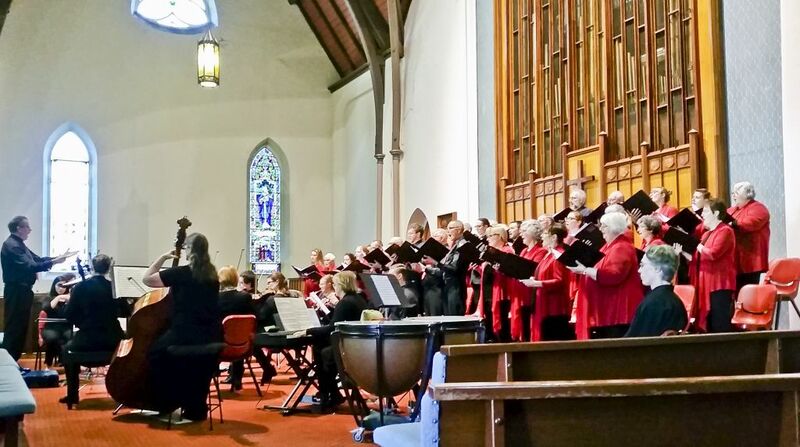 The Geelong Chorale was accompanied by Kristine Mellens (piano) and Frank De Rosso. The guest artists for this concert were the Geelong Handbell Choir. 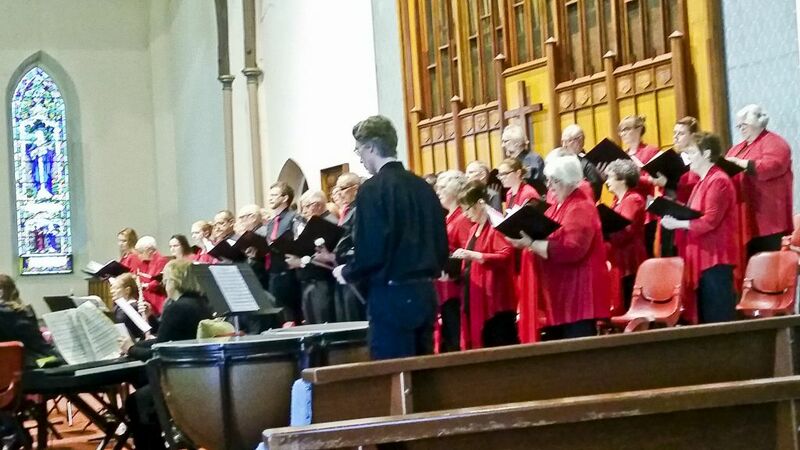 The concert began with Australian bird song imitations from the choir placed at the rear of the church. The work was If Christ had been born in another time composed by Australian Matthew Orlovich. This set the tone for music of high quality and audience appeal. Carols ranged from traditional English and European, to modern works including Of a Rose, a Lovely Rose (Colin Brumby), Jewel Carol, composed by New Zealander Christopher Marshall and Shepherds Pipe Carol (John Rutter). There were several songs for audience participation. 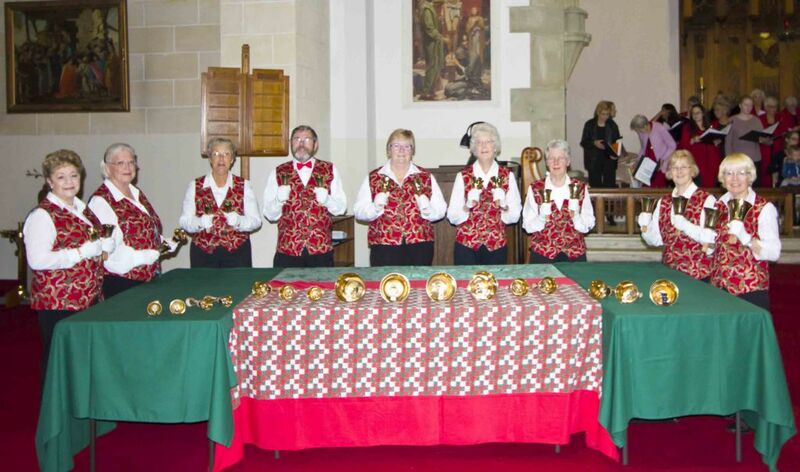 The Geelong Handbell Choir was a popular guest artist, playing a selection of carols, and finishing with some light-hearted schmaltz – a setting of Irving Berlin’s White Christmas. As is usual for the Geelong Chorale’s Christmas concerts, the concert ended with We Wish You a Merry Christmas (English West Country carol) in a spectacular setting by Arthur Warrell. This Christmas concert continues the Geelong Chorale’s Christmas tradition of carol concerts. These started in 1981 – the Year of the Disabled*. Originally, a free gift from the Chorale to the community, the aim was to present a short, easily accessible concert of traditional and new carols to the community, particularly targeting people who find attending outdoors ‘carols by candlelight’ events difficult. The first concerts were held in the Geelong Art Gallery, and later the foyer of the Geelong Performing Arts Centre. Children sat on the floor, and the venues were easily wheel-chair accessible. Several aged care centres brought busloads of people to attend. With the local ‘carols by candlelight’ cancelled due to bad weather, it’s a pity that the Chorale’s alternative offering was not better advertised. The rather small audience certainly enjoyed the concert. *Prior to 1981, the Gama Singers (now the Geelong Chorale) gave annual Christmas cafe concerts. Read Colin Mockett’s review of Christmas Around the World at Entertainment Geelong.